Whether you are a student, an apprentice, or a master at your craft, you have experienced a creative block at one time or another. Everyone does. What matters is not whether or not it happens, but what you do to overcome those blocks. The last thing to do is give up, of course, but sometimes it feels like you have run out of ideas. If you are in that space right now, it is time to look at options you might not have considered before. Feng Shui has been around for thousands of years. It is an ancient Chinese philosophy based on observation and custom. At the root of Feng Shui is the concern about balancing your energy flow, or Qi. If your Qi is out of balance, a number of things can go wrong. Unlike what some websites (especially those trying to sell things) will say, Feng Shui is not a matter of buying a trinket and thinking that your problems are solved. It is a complex set of principles and ideas. Here are some Feng Shui ideas to help overcome creative blocks. #1. 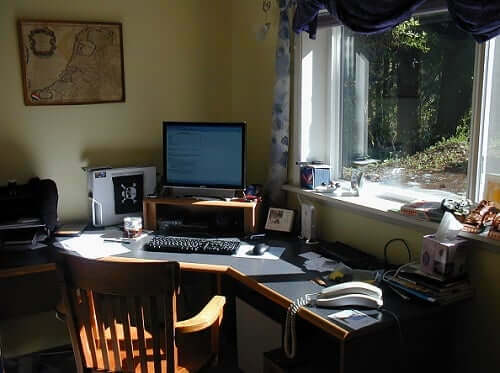 Your workspace; do you have one? In order to have good workflow, you must have a positive workspace. It does not need to be large, but it does need to feel personal. If you do not currently have one, make a list of what you need out of a workspace. Be realistic with your budget and space accommodations. If your space is limited to a desk, then focus on this space and make it your own. Feng Shui teaches that personal space is sacred; creative personal space is no different. If possible, try to keep this office space separate from the bedroom, as the bedroom is really meant to be a place for sleep. This may seem like common sense, but there is a Feng Shui reason behind it. Energy (like water or air) must have clear pathways to flow freely. If it is blocked, it pools and becomes stagnant, much like your creativity. Sounds familiar? Whether your space is big or small, remove distractions such as bills, trash, dirty dishes, electronics (unless you use them), or bits and pieces of materials you don’t intend to use in the near future. If your creativity revolves around crafts, organize your materials in bins made out of plant materials. Feng Shui is based on the five elements: wood, fire, earth, metal, and water. Wood is associated with new beginnings and fresh starts. Likewise, if you pursue fine arts such as painting, sculpting, or mixed media, you too should arrange your supplies in plant-based containers. These could be actual wood, reeds, or willow baskets, for example. They should be in easy reach, but they should not clutter the eye. For writers, keeping supplies in wood holders is also a good idea. You, the artist or writer, should never sit with your back to the door. This will lead to feelings of insecurity. That being said, there is nothing wrong with rearranging your space if it starts to feel stagnant. Again, Feng Shui is all about the movement of energy. If it feels stagnant, it probably is. Make sure you have room to walk freely around your desk, table, easel, etc. Make this space comfortable, but stimulating. Remember, this is about balance. It could be that you are too comfortable and not challenged enough, or it could be that you are overstimulated and burned out. Color can produce powerful emotional responses; it all depends upon the person and the situation. If you are easily overstimulated and find yourself starting projects but not finishing them, then greens, reds, oranges, and bright pinks are not a good pick for you. Much better are blues, blacks, pale yellows, or earth tone colors. The reason why is because greens are associated with the wood element. Read about color symbolism. While some wood presence is good, too much is not good for people who are always starting but never finishing things. The other bright colors listed are associated with the fire element. Too much fire presence is overstimulating and creates anxiety. Blues and blacks are associate with the water element, which is tranquil and meditative, while the rest of the colors are associated with the earth element, which is stable and sensible. If you have the opposite problem, if you are “stuck” and cannot seem to get motivated, then the opposite color rules apply to you. You need new life or a fire lit inside you. Try experimenting. You could try for three neutral or lightwall colors and one bold one to start with. Some artists even prefer their spaces to be “clean slates” or completely blank white; otherwise, they find themselves distracted. It really is up to you, but don’t be afraid to experiment. An afternoon of painting and furniture arranging can make a world of difference for your creative output! This is often recommended for children, but why not for adults too? On the south wall of your space, hang a vision board (or dedicate the whole wall) to awards, contracts, or pictures of your works. Include pictures of people in the field you admire, and be sure to shine a light on this space. Feng Shui practitioners claim that this will bring you luck and recognition in your field. Not only that, but if you need a boost, looking at your past accomplishments or looking up to people who have “made it” could give you the break you were looking for. Add an aquarium, fountain, or plant in this corner of the room, depending upon what you are looking for. The water element is known to enhance wealth, so it is good luck to add water elements in this corner, also known as the wealth segment, of the room. You just may make more money with your work. Adding a plant, which is a wood element, can aid in creativity, and help generate new ideas. Unlike painting entire walls, these small touches add positive energy without overpowering the room. #7. Handle the mental clutter, too. So far, this has been a discussion of the space, not you. One of the biggest blocks to creativity is a fear (or sense) of failure. This can come from a stack of unfinished projects taking up physical and mental space. This may be difficult, but take a weekend and confront those projects. Ask yourself the tough questions. Look at your projects, one at a time. Will you ever finish this one? Is it under contract? If you will likely never finish it, and you are not under contract, take the difficult step of removing this “clutter.” Move on to the next project. These constant reminders will only weigh you down. How is this Feng Shui? Energy flows through your spirit as well as your physical space. If the spiritual space is cluttered, it will become stagnated. It needs a good cleaning, too. Clear out the negative thoughts along with the trash. Meditation is an excellent help. Next, take on one project at a time. Only focus on that project; the one with the most immediate deadline.